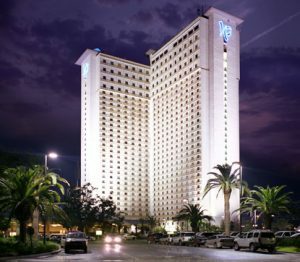 Imperial Palace, Biloxi, Mississippi: Imperial Palace is a 34-story Casino and Hotel. Kemco is proud to have partnered with Roy Anderson Corp in the rebuilding after Hurricane Katrina. Kemco cutout and resealed the exterior stucco and window joint systems. Hancock Bank, Gulfport, Mississippi: Kemco Inc. assisted Roy Anderson Corp on the Hancock Bank project with the remedial work due to damage from Hurricane Katrina. Kemco cut out and re-caulked the existing limestone panels and caulked new GFRC panels. Sealants were also installed for DeGeorge Glass at window system perimeters. The original limestone panels were cleaned and sealed with Prosoco products. Sienna Condos, Gulfport, Mississippi: This ¬12-story condominium building required stucco repair and new silicone wall coatings. Joint sealants around existing windows were cutout and re-caulked, and Kemco Inc. Specialty Contractors also installed new liquid applied acrylic roof coatings. Naval Research Building at Stennis Space Center, Hancock County, Mississippi: Kemco Inc. Specialty Contractors was hired to cutout and re-caulk expansion joints in precast concrete panels to eliminate water intrusion issues. Ocean Club Condominiums, Biloxi, Mississippi: This 17-story condominium needed work done to the balconies and window seals. Kemco Inc. Specialty Contractors recoated all balconies with urethane pedestrian coating and wet sealed curtainwall windows with silicone sealant. Sea Breeze Condominiums, Biloxi, Mississippi: This ocean-front condominium was leaking water from many of the curtain wall windows and needed repairs to the pool deck coating. Kemco Inc. Specialty Contractors was hired to recoat both pool decks with chemical resistant urethane pedestrian coating and wet seal the curtain wall window system with silicone sealant. Old Brick Hancock Bank Building, Gulfport, Mississippi: This multi-level bank building in downtown Gulfport required major exterior restoration. Kemco Inc. Specialty Contractors provided a full masonry restoration including cleaning and sealing all masonry, tuck pointing deteriorated mortar, and re-caulking sealants at window openings. MGM baseball Stadium, Biloxi, Mississippi: Neo-Gard deck coating was applied to the seating areas. Kemco Inc. also power washed and sealed the seating bowl and parking garage. Below grade waterproofing was installed at all walls of the elevator pits.